Spring 2019 update: (03/25/2019). Quill shuttles all sold out. More will be available in 2019. 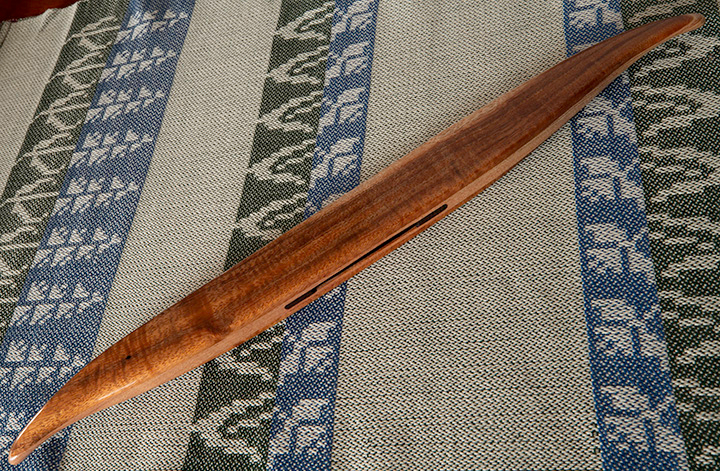 Quill shuttles are typically used in Scandinavian weaving or on looms with narrow sheds. Quills are economical – they may be purchased or made from stiff paper. Quills hold more yarn than a bobbin of comparable size and are quieter to use. Many weavers prefer the use of quills for better selvedges. Canopus Quill shuttles are made up of 3 (or rarely 5) layers of figured hardwoods, typically combinations of bird’s eye maple, tiger maple, curly cherry, curly white oak, black walnut, koa, mango, and honey locust. Shuttles are highly contoured and fine sanded to 2000-grit with 10 coats of finish applied. A 3.5mm polished stainless steel rod fits standard cardboard quills, and operates up & down using an internal spring mechanism. Extremely hard Brazilian ebony, or sometimes lignum vitae inserts are placed at either end of the yarn slot to reduce wear from abrasive yarns like linen and hemp. The spring slot on top is covered either with ebony (black) or pink ivory (red). In the shuttle descriptions below, we list the shuttle weight, L,W,H, length from the end of the cavity to the tip of the shuttle for either end (this is important to some weavers), and quill length handled by shuttle (4″ or 6″). Damask shuttles are less than 3/4″ height. 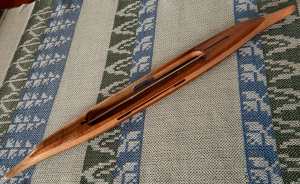 Any quill shuttle: $120 plus shipping. Personal check or USPS Money Order is preferred. **(sample shuttle only)**f2018Qkoahloc3: Koa top/bottom, honey locust center. Brazilian ebony yarn slot inserts. 3.7 oz., 15″L, 1 1/2″W, 3/4″H, 4″ tip to nearest cavity end. Fits 6″ quills.